Lakeside boss Will Pottinger hailed last heat hero Nick Morris after they snatched a 45-44 win at Ipswich. Morris dusted himself down from a heat 13 spill to brilliantly round Rory Schlein on the second lap of a heat 15 decider and give his side three points. The result means the Hammers have secured their spot in the semi-finals of the Championship Shield and have now won four on the bounce in all competitions. “Nick showed great character to dust himself down after falling when leading heat 13 to split the Ipswich riders and seal the win in the last race,” Pottinger said. “It was a great first lap in heat 15 to get to second place, and we’re delighted to win against a strong Ipswich side. “We were never behind, successfully negotiated a tactical ride by the Witches and had a lot of race winners again which is a pleasing aspect, and we’re happy to be into the next round of the Shield. It was another impressive team performance from the Purfleet side against a powerful Witches line-up. Richard Lawson top scored with 11 points whilst Adam Ellis and Kyle Newman played vital roles against their former club. With Zach Wajtknecht, Alfie Bowtell and Ben Morley all adding solid scores the Hammers had the edge. They will be back in action at Berwick next Saturday (7pm), with their next home meeting at home to Ipswich in the Knockout Cup on Friday, May 4 (8pm). Danny King 15+1, Rory Schlein 10+1, Cameron Heeps 5+2, Danyon Hume 5+1, Michael Haertel 4, Nico Covatti 4, Connor Mountain 1. 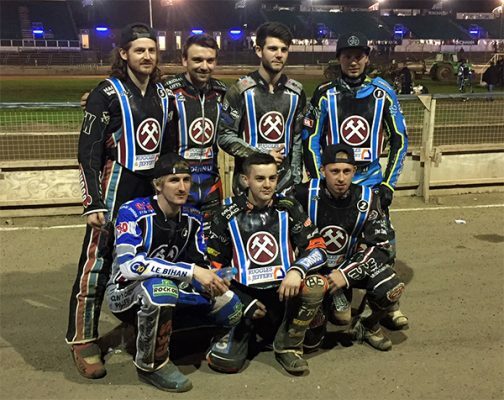 Richard Lawson 11, Nick Morris 9, Adam Ellis 8, Kyle Newman 7, Zach Wajtknecht 5, Ben Morley 3+2, Alfie Bowtell 2+1. 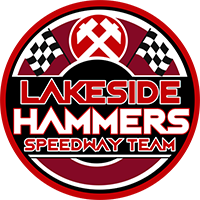 « Hammers victorious	» Grab a pit board by May 11th!